WU-TANG CLAN producer and rapper RZA is suing a New York dog walking company for breach of the group’s copyright. Brooklyn-based Woof-Tang Clan claims to be the “illest group of dogs in New York City” and says that they are “committed to showing your dog a good time” but they have drawn the ire of the Staten Island hip hop group. 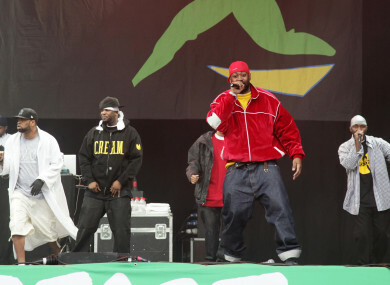 Court papers filed said that the Wu-Tang Clan’s name and logo were “unmistakably associated” with the group since its formation in 1993. The dog walking company’s owner Marty Cuatchon told the New York Daily News that he was aware of the legal challenge. Cuatchon declined to comment further as he was seeking legal advice. In a “shop” section of the company website, Woof-Tang Clan were selling tshirts that showed dogs on classic album covers, including ones by the Wu-Tang Clan but they’ve since been taken down. Also on the company’s website, it says that staff are “courteous and responsible, as long as we’re in agreement that Nas’ Illmatic is the greatest album of all time”. The Wu-Tang Clan had recently been caught up in another bizarre saga, when disgraced former pharmaceutical executive Martin Shkreli sold his unique copy of one of their albums for over €1 million on eBay. The band itself had already decreed that the music will not be made available until the year 2103, although whoever owns it is allowed play it at private parties. Read: What happens if you put a sign language interpreter at a Wu Tang gig? Email “Wu-Tang Clan suing dog walkers Woof-Tang Clan over copyright infringement”. Feedback on “Wu-Tang Clan suing dog walkers Woof-Tang Clan over copyright infringement”.